Daedric Summoning is the last but not the least Sorcerer’s skill line. Spells of this school in Elder Scrolls Online are based on ancient Daedric magic that allow caster to summon creatures, curse enemies and use protective spells in battle. This path has different abilities with different effects. Such variety makes this line universal and many of players will use these spells for different builds. Active abilities of Daedric Summoning are different. Summon Storm Atronach allows you to summon powerful helper. The atronach stuns foes in the target area and casts lightning spells dealing damage to all surrounding foes. It is a great spell for any encounter. Unstable Familiar summon a Daedric helper that attack foes. The helper is not as strong as Storm Atronach but anyway will help you a lot. Daedric Curse applies a curse to a target foe. When the curse expires it damages all nearby enemies. Summon Winged Twilight allows Sorcerer to summon another helper. Winged Twilight start to attack enemies after summoning. It is more powerful spell than Unstable Familiar. Bound Armor allows caster to use benefits of magical armor increasing protection of the character. Conjured Ward helps Sorcerer to protect himself and his summoned creatures applying a damage shield that absorbs a part of incoming damage. There are also great passive abilities in Daedric Summoning. The passives allow to receive Magicka energy after your summoned helper is killed, reduce the Ultimates’ cost, increase regeneration of health and give different additional bonuses to summoned helpers. To find out more read description of passive spells. The name of the school tells a lot. Daedric Summoning allows to call for the help of Daedric forces in order to use their help to win. A character who specializes in Daedric Summoning only can have two summoned helpers and a Storm Atronach. If sorcerer has enough Magicka and Ultimate points to summon all of them at once – be careful. It is a real army :) It seems such playing style can be really unusual. Summoned creature will deal most of the damage while protective spells will help caster to survive. The tactics against such sorcerer in PvP or duel must be unusual and such opponent can be really strong. General weakness of characters who focus on Daedric Summoning only is that their strength depend on summoned helpers. They are strong when they summon several creatures, but they need to be careful and avoid center of the battlefield most of the time. Anyway each class has its own pros and cons. Class system in Elder Scrolls Online allows players to create their own builds. The Daedric Summoning path has good abilities that can be mixed with skills from other magic schools. If you play as a tank or you just want to get more protection you will probably like the effect of Bound Armor. The stunning effect of Summon Storm Atronach may help those who like crowd control and massive encounters. 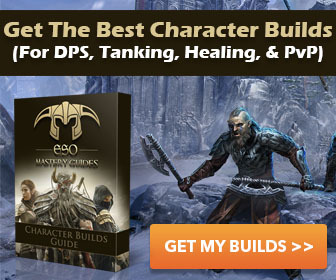 As you can see there is a great potential for creating your own build. That’s why we love ESO!